Google AdWords is an advertising system in which advertisers bid on certain keywords in order for their ads to appear in a Google’s search result, these clickable ads are paid for by advertisers. We can help you to get started with the setting up of an AdWords campaign, creation of ad groups, finding suitable keywords for your business, budget planning & bidding guidance. We have a long history of experience in managing the Google AdWords Campaigns on behalf of our customers. A Google ad network allows the users to generate the campaign taking care in its creation to obtain the best results possible. We provide assistance in suggesting keywords for your campaign after undertaking ample research to optimise for higher conversion rates. We also provide the reporting and performance services for the Google AdWords Campaigns which give users a clear picture of where your standing. Reach out to new customers and grow your business with AdWords with our help here at Western Webs, find out more about the Goggle AdWords service we offer. Get in touch with us here at Western Webs for all the help you need in setting up your Google AdWords Campaign. 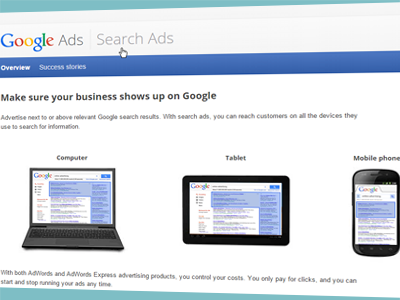 Make good use of Google’s AdWord campaign and get ahead of your competitors!